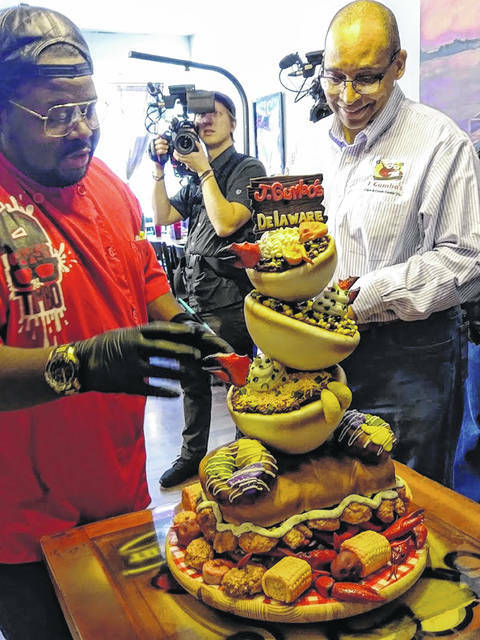 A camera crew working on an episode of Food Network’s “Ridiculous Cakes” films the unveiling of the cake made in recognition of the sixth anniversary of the opening of J. Gumbo’s Delaware. Pictured in the downtown Delaware restaurant are Tim “Timbo” Sullivan (left), who made the cake, and restaurant owner Richard Upton (right). 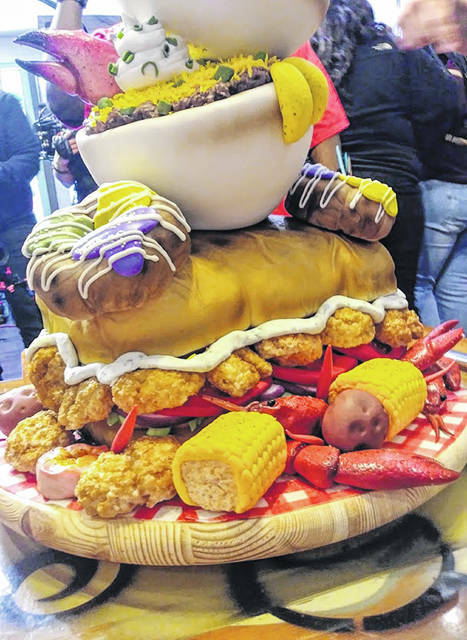 Pictured is a closer look at the bottom half of the J. Gumbo’s Delaware cake that was featured on a recent episode of “Ridiculous Cakes” on the Food Network. When it comes to hosting a memorable anniversary party, one decision can often make or break the celebration — the choice of cake. Based on the response and nationwide attention J. Gumbo’s Delaware received for its sixth anniversary cake, it appears business owners Richard and Nathalie Upton nailed that decision. On March 10, the Uptons celebrated their sixth year of business in downtown Delaware by hosting a party that included family, friends, a film crew, and the star of the show — a one-of-kind cake featuring J. Gumbo’s Cajun/Creole cuisine. In his cable television debut, Richard Upton challenged Sullivan to come up with a masterpiece for J. Gumbo’s anniversary bash. “I want an over-the-top cake that looks like our food,” Upton said. The challenge was on from there. Sullivan, however, was up to the challenge. “(Crazy) is what we do here,” he told Upton. Before getting started on the vanilla cake, which was filled with vanilla butter cream and white chocolate chips, Sullivan and his team had to make every single ingredient for the Cajun dishes, which included using fondant to handcraft items like oversized black beans and grains of rice. During the episode, Sullivan noted that making the ingredients for the three bowls of gumbo was time-consuming, but it wasn’t the most difficult task. “The hard part is air brushing the food items (with edible paint) to make them look realistic,” he said. While the television audience recently got the opportunity to see the finished result on season two, episode four of “Ridiculous Cakes” on Food Network, the Uptons and anniversary party guests got their first look back on March 10 when the cake was delivered to J Gumbo’s Delaware at 9 N. Sandusky St.
“He just knocked it out of the park,” Richard Upton said after seeing the cake for the first time. After the show aired, Upton told The Gazette the cake tasted “excellent,” and he was actually “speechless” when the cake was unveiled. Upton said Sullivan’s greatest talent is probably his artistry. As for appearing on cable television, Upton wasn’t concerned much with getting his 15 minutes of fame. Instead, he was just grateful for the exposure his restaurant received by being on Food Network. “As a Delaware resident and business owner, I was happy to see us get a brief moment on the national stage in a positive venue,” he said. The exposure had an immediate impact on the business, Upton added. Joshua Keeran can be reached at 740-413-0900. Follow The Delaware Gazette on Twitter @delgazette. Like The Gazette on Facebook.